Pilates burns up to 300 calories a session. Most importantly, the method creates lean muscle mass to help you burn more calories as you go about your daily activities. Pilates Muse Private Training differs from group classes. The sessions concentrate on your specific body issues. The exercises are designed to stretch and strengthen every muscle in your body. One on one instruction verifies that you are actually applying Pilates technique. This results in long, slender and defined muscles without bulk. Pilates is the original core strength training. The core, or “powerhouse” in Pilates terminology, is made up of the upper and lower abdominal muscles, the lower back, and the buttocks. Conventional forms of exercise develop strength in the arms and legs, but largely ignore this area because these muscles are difficult to isolate and strengthen. The core is the same set of muscles that support good posture and, if not used properly, will deteriorate with time and aging. Authentic Pilates technique is designed to stabilize the torso and work the muscles of the powerhouse lower, deeper, and more intensely. All movement is initiated from the center, which strengthens supporting muscles deep within the body, muscles that typically get overlooked. By stabilizing the body’s core and mentally anchoring movement from the center, one’s arms and legs can move freely from a stable and flexible spine, increasing coordination, control and strength. J. Pilates called his method “Contrology.” He believed that his method uses the mind to control the muscles. 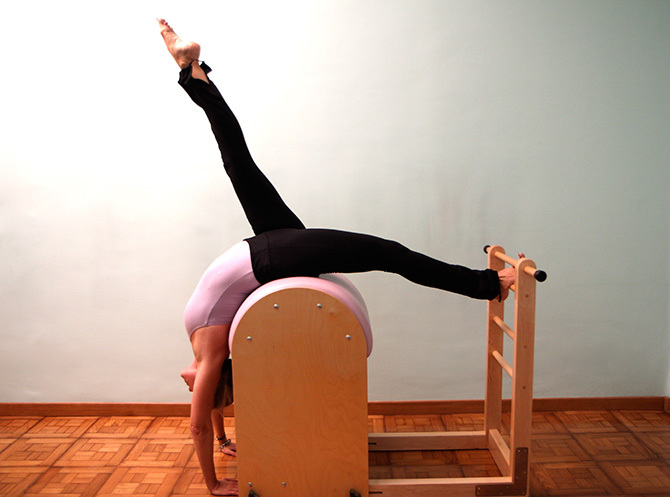 Pilates technique tries to increase strength, flexibility and control of the body through exercises that require heightened mental awareness during movement. High levels of concentration, control, and centering (three Pilates principles) have a positive effect in rejuvenating the mind body connection. Modern scientific clinical studies reveal what the ancient Greeks already knew: Know thyself. This connection is the basis for optimal physical, mental and emotional health. Balance and coordination originate within the body’s core. As every successive Pilates exercise requires core engagement, you can expect a drastic increase in your coordination, grace, and balance. Excellent for people who suffer neck, lower back and scoliosis pain. Pilates exercise is low impact and can be performed by people of varying degrees of physical fitness and health. It is distinguished by using positions and equipment that support your back and neck with special caution given to injured or weak areas. Authentic Pilates is designed to correct posture and body symmetry by increasing flexibility and exerting precise attention to alignment. Areas of weakness are strengthened through coordinated body movement using muscle groups and resistance training. Mr. Pilates was a western exercise pioneer in his basic emphasis on breathing to purify and invigorate the body with oxygen. Breathing and stretching helps push higher levels of oxygen and nutrients to all cells in the body through the blood’s circulation. Pilates technique is designed for a systematic renewal of energy in the body’s organs and muscles during physical activity. The Pilates Muse is for everybody: men, women, young, old, athletes and weekend walkers. The training changes your life: you sit better, you sleep better, walk better, and have a heightened awareness of your own body. One exits a Pilates training session with a revitalized body, serene mind, and enhanced sense of wellbeing. Why not try it in person? Experience for yourself how Pilates can increase your quality of life! For more information call the Pilates Muse today at tel. 06/9293 7400, Cell. 338/1096 895 or email us at [email protected].